Aquatic Animals Research Experience - petraditsches Webseite! In the Aquatic Animals Research Experience* students explore a research topic in close collaboration with a supervisor. The topics are open ended but one thematic focus is on functional morphology and biomechanics of fish and invertebrates. This includes such questions as: How does an anemone attach to different substrates? Does shark skin really reduce friction drag? Are there surfaces that barnacles cannot attach to? How elastic is a sea cucumber skin? … and many more. Ecologically oriented topics are also an area of interest. Potential questions might include: What is the impact of selected physicochemical factors on animal species? How does distribution of species change with abiotic parameters of the landscape? In close collaboration with local mentors we provide a list of preselected topics, and students may also propose their own ideas. Students engage in a supervised practical research experience and learn more about scientific thinking and the process of becoming a professional scientist. Techniques learned will be related to the chosen topic and could include scanning electron microscopy, mechanical testing, high speed videotaping, and flume or field experiments. Some students of the Aquatic Animals Research Experiences 2014 and 2015 presented their project results at conferences. 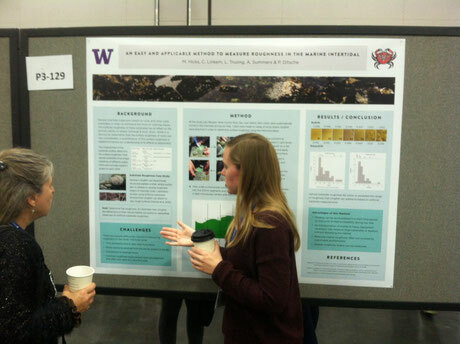 Maddie Hicks (University of Washington) presents her poster “An easy and applicable method to measure roughness in the marine intertidal” at the annual meeting of SICB in Portland, Oregon, 2016. Kelly Christiansen (University of Washington) at her poster “Super Suckers? 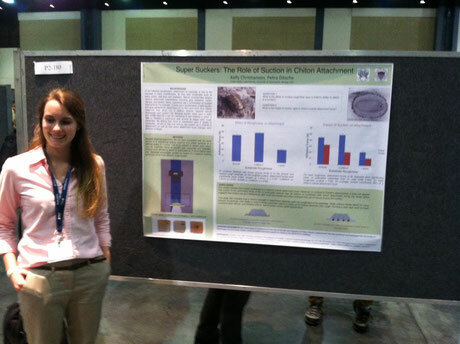 - The Role of Suction in Chiton Attachment” at the annual meeting of SICB in West Palm Beach, Florida, 2015. Kelly Christiansen won the Casey Award to travel to SICB and present her exciting results on Chiton attachment. 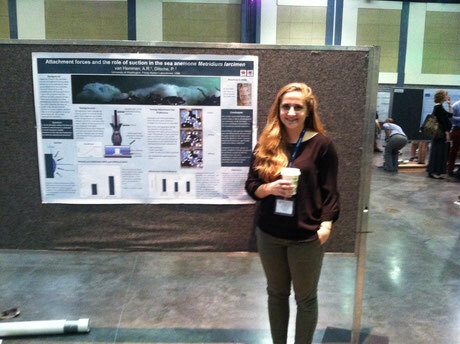 Abby van Hemmen at her poster “Attachment forces and the role of suction in the sea anemone Metridium farcimen” at the annual meeting of SICB in West Palm Beach, Florida, 2015.